That very question came to mind when I recently bought a collection that had a few back bars in it. One of them, is decorated with "1860 Bourbon". It is executed in a copper wheel cut design, on a high quality decanter that appears to have a very faint amethystine cast to it. It was blown in a two piece mold with a sunburst design on the base and an intricate pseudo cut glass pattern embossed into the neck that does a 90* counterclockwise twist. First, the "why" behind the name... Well, two things come to mind as being the prompting behind the brand. First would be April 1860. Note the following; Tuesday 03: The first successful Pony Express run from Saint Joseph, Missouri to Sacramento, California begins, and is completed on April 13. Hmm. Sounds good to me and certainly a reason to quaff a good bourbon! And then... November 1860; Tuesday 06: U.S. presidential election, 1860: Abraham Lincoln is elected as the 16th President of the United States, the first Republican to hold that office. I'll certainly drink to that as well! The break came while tracking down some info for a fellow collector on our pal, ol' J. Clute Wilmerding. 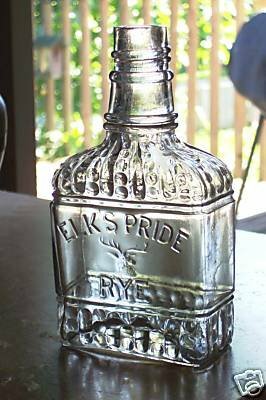 Although he first partnered with Calvin Kellogg in 1868, he'd been involved in the west coast liquor business for quite a few years before then. In fact, Clute first showed up in "The City" in 1859; as "(Fargo & Co) 52 Front." This according to the Crocker Directory. 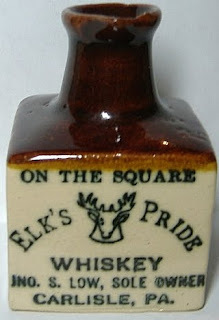 Fargo & Co. is listed as a liquor Wholesaler, but not as a retailer. Wilmerding is listed as neither. And, he also is not listed as having any residence or address, other than that of 52 Front St. Things must have changed for the better because in 1860, he is listed with both Fargo as an employer, and a residential address of "rooms 622 Sacramento". 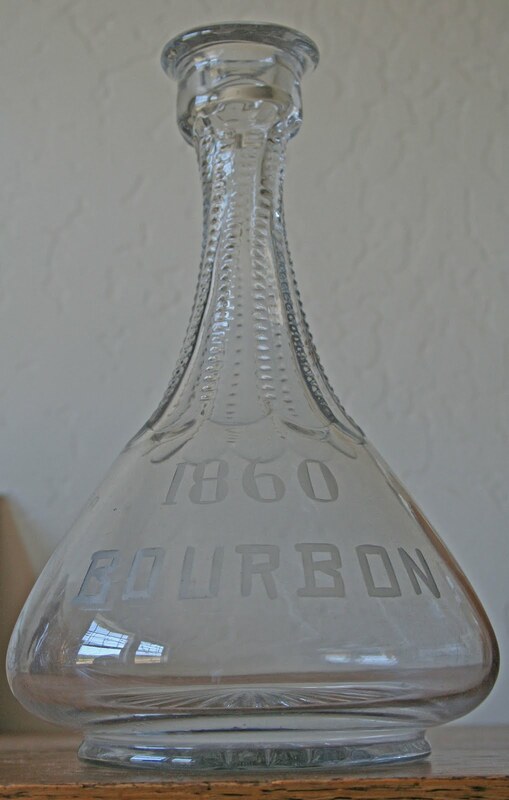 The jewel in the crown came when the search for registered whiskey brand names came back with one result, and one result only for 1860 Bourbon; "Wilmerding - Loewe Co. of San Francisco, CA." 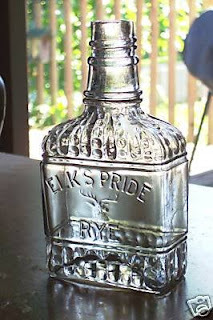 Their brands included; "1860 Bourbon", "Days of 49", "Kellogg", "Kellogg's", and "Kellogg's AA.". The company link, in and of itself, helps to further narrow down the timeline since they were listed from 1896 - 1918. I'd date this critter to ca. turn of the century based on the manufacturing techniques employed and the obvious manganese dioxide base of the cullet. The why behind the name remains a mystery. Maybe a letter head or an invoice will surface someday with more info. For now, I'd guess that Clute was influenced by his good luck back in 1860 combined with either nostalgia for the pony express or patriotic exuberance over Lincolns ascendence to the presidency back in the day.